Initially brought to New Zealand as a garden plant, it was first recorded as naturalized in 1946 (Sykes 1982) (Linking seed dispersal, germination and seedling recruitment in the invasive species Berberis darwinii (Darwin’s barberry)). In Australia, the species is naturalised in the states of South Australia, Victoria, New South Wales and Tasmania. The species has also become sparingly naturalized in the US states of California and Oregon (EOL). McAlpine, K. G., & Jesson L. K. (2008). Linking seed dispersal, germination and seedling recruitment in the invasive species Berberis darwinii (Darwin’s barberry). Plant Ecology. 197, 119–129. Initially brought to New Zealand as a garden plant, it was first recorded as naturalized in 1946 (Sykes 1982) (Linking seed dispersal, germination and seedling recruitment in the invasive species Berberis darwinii (Darwin’s barberry)). In Australia, the species is naturalised in the states of South Australia, Victoria, New South Wales and Tasmania. The species has also become sparingly naturalized in the US states of California and Oregon (EOL). Many of these areas overlap substantially with California's climate (Cal-IPC global map of climate areas matching California). Berberis darwinii Hook. (Berberidaceae) is a spiny evergreen shrub native to southern Argentina and the Chilean Andean forests, and is an introduced invasive species in New Zealand (Allen 1991), Great Britain, Australia and the USA (USDA 2006) (Effect of light on the growth and photosynthesis of an invasive shrub in its native range). It was originally brought to New Zealand for horticultural purposes, but has since invaded many vegetation types throughout the country (Photosynthesis and water-use efficiency: A comparison between invasive (exotic) and non-invasive (native) species). This species is regarded as an environmental weed in Victoria, ACT, Tasmania and New South Wales. It is currently also listed as a priority environmental weed in one Natural Resource Management region. In Victoria it has invaded relatively undisturbed wet sclerophyll forests in the Dandenong Ranges. Darwin's barberry (Berberis darwinii ) will eventually form dense impenetrable thickets if left unmanaged and it is considered to represent a potential threat to one or more vegetation formations in this state. In New South Wales, Darwin's barberry (Berberis darwinii) has become established in bushland in the Blue Mountains, and is of concern in the wider Sydney and Blue Mountains region. It also has a restricted distribution in the ACT, but is considered to have a moderate to high weed potential in this region. In Tasmania several relatively small populations are being managed by government authorities (e.g. at Scottsdale in the north, at Fern Tree and Cockle Creek in the south, and at Williamsford in the west of the state) with the goal of eradication if possible. This species is also invasive in a range of vegetation types in New Zealand, and is considered to be a serious threat to native species and ecosystems in many parts of this country too (Weeds of Australia Biosecurity Queensland Edition). Svriz, M., Damascos M. A., Lediuk K. D., Varela S. A., & Barthélémy D. (2014). Effect of light on the growth and photosynthesis of an invasive shrub in its native range. AoB Plants. 6, plu033. McAlpine, K. G., Jesson L. K., & Kubien D. S. (2008). Photosynthesis and water-use efficiency: A comparison between invasive (exotic) and non-invasive (native) species. Austral Ecology. 33, 10–19. Berberis darwinii Hook. (Berberidaceae) is a spiny evergreen shrub native to southern Argentina and the Chilean Andean forests, and is an introduced invasive species in New Zealand (Allen 1991), Great Britain, Australia and the USA (USDA 2006) (Effect of light on the growth and photosynthesis of an invasive shrub in its native range). It was originally brought to New Zealand for horticultural purposes, but has since invaded many vegetation types throughout the country (Photosynthesis and water-use efficiency: A comparison between invasive (exotic) and non-invasive (native) species). This species is regarded as an environmental weed in Victoria, ACT, Tasmania and New South Wales. It is currently also listed as a priority environmental weed in one Natural Resource Management region. In Victoria it has invaded relatively undisturbed wet sclerophyll forests in the Dandenong Ranges. Darwin's barberry (Berberis darwinii ) will eventually form dense impenetrable thickets if left unmanaged and it is considered to represent a potential threat to one or more vegetation formations in this state. In New South Wales, Darwin's barberry (Berberis darwinii) has become established in bushland in the Blue Mountains, and is of concern in the wider Sydney and Blue Mountains region. It also has a restricted distribution in the ACT, but is considered to have a moderate to high weed potential in this region. In Tasmania several relatively small populations are being managed by government authorities (e.g. at Scottsdale in the north, at Fern Tree and Cockle Creek in the south, and at Williamsford in the west of the state) with the goal of eradication if possible. This species is also invasive in a range of vegetation types in New Zealand, and is considered to be a serious threat to native species and ecosystems in many parts of this country too (Weeds of Australia Biosecurity Queensland Edition). Many of these areas overlap substantially with California's USDA Hardiness Zones (Cal-IPC global map of climate areas matching California). Berberis glaucocarpa is a weed in New Zealand (Weedbusters). B. vulgaris is a weed in Washington (Washington State Noxious Weed Control Board) and an environmental weed in the southern highlands of New South Wales and as a "sleeper weed" in other parts of south-eastern Australia. It is currently listed as a priority environmental weed in one Natural Resource Management Region. This species is also an alternate host for a potentially damaging stem rust disease of wheat crop (Weeds of Australia Biosecurity Queensland Edition). These areas overlap with California's climate zones ( Cal-IPC global map of climate areas matching California. ). Grows best in USDA Hardiness Zones 7a-8b (Dave's Garden). Present in Ireland, UK (Zones 7a-8b), other parts of northern Europe, New Zealand (8a-11b), California, Washington, southeastern Australia, southern South America (GBIF). However, most of the areas where B. darwinii occurs do not match California's climate (Cal-IPC). In New Zealand B. darwinii can become established and persist below the forest canopy (Allen 1991; Allen and Wilson 1992). According to McAlpine and Jesson (2007), seedlings of this species are shade intolerant, while adult plants growing under the canopy come from surviving seedlings with increased shade tolerance. However, although this shrub can grow in both low and high light levels, it achieves higher performance (seedling establishment, total biomass, maximum photosynthesis) in the latter conditions, outperforming even coexisting native species (McAlpine 2005; McAlpine et al. 2008). Berberis darwinii is a shrub that grows up to 2 m in height. It is important to note that in the invasion area the maximum photosynthetic rate of B. darwinii is almost double that of native species in sun, but is similar to all the other species in shade, and stomatal conductance is higher than coexisting native species in the latter environment (McAlpine 2005; McAlpine et al. 2008) (Effect of light on the growth and photosynthesis of an invasive shrub in its native range). Grows up to 4 m high (Linking seed dispersal, germination and seedling recruitment in the invasive species Berberis darwinii (Darwin’s barberry)). B. darwinii seeds germinated more in shady sites than the other natives, but survival was low. In contrast, while germination of B. darwinii was the same as the native species in sunny sites, seedling survival after 18 months was nearly twice that of the all native species. The maximum photosynthetic rate of B. darwinii was nearly double that of all native species in the sun, but was similar among all species in the shade. Other photosynthetic traits (quantum yield and stomatal conductance) did not generally differ between B. darwinii and the native species, regardless of light environment. 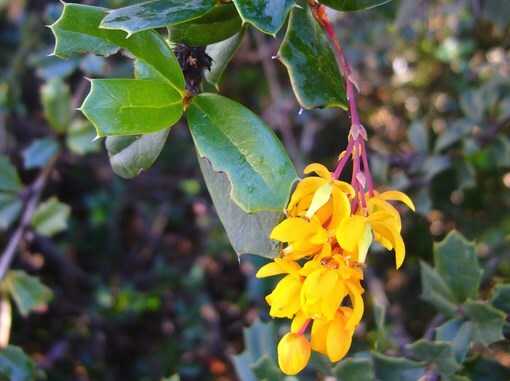 Berberis darwinii had more positive values of d13C than the four native species, suggesting that it gains more carbon per unit water transpired than the competing native species. These results suggest that the invasion success of B. darwinii may be partially explained by combination of a Jack-of-all-trades scenario of widespread germination with a master-of-some scenario through its ability to photosynthesize at higher rates in the sun and, hence, gain a rapid height and biomass advantage over native species in favourable environments. It forms dense, impenetrable stands that exclude native species, and can also persist beneath the native forest canopy (Allen 1991) (Photosynthesis and water-use efficiency: A comparison between invasive (exotic) and non-invasive (native) species). Once established can replace native understorey plants’ (Weber 2003). Major displacement of some dominant species within the lower strata (Victorian Invasive Plants). Its growth habit allows it to form dense, impenetrable thickets that exclude other plants (Weed Risk Assessment: Berberis darwinii). Tasmanian government (0). Weed Risk Assessment: Berberis darwinii . Evergreen shrub (Webb et al 1988). Possible that the shrub may decrease fire frequency (Brooks et al 2004) although not documented for this species (Victorian Invasive Plants), however no evidence of changes to fire regimes or fire promotion were found. Since an exhaustive Google/Google Scholar search did not reveal any evidence, this defaults to a “no” answer at this time. Ingestion may cause mild stomach upset (RHS). Plant has spines or sharp edges; use extreme caution when handling (Dave's Garden). Has spines (3-7mm) and leaves of vegetative shoots sometimes have additional spiny teeth below (Webb et al 1988). Not documented although may cause fauna to lose condition (Victorian Invasive Plants). Major toxicity (Calflora). Edible purplish black barberries are produced in summer. They are tart, seedy and can be used to make jam. There is evidence to show the fruits were eaten by the earliest human inhabitants of southwestern South America (Learn 2 Grow). Spines may cause physical injury to people and animals (Weed Risk Assessment: Berberis darwinii). However, an exhaustive Google/Google Scholar search did not reveal any evidence of any impacts or issues with this plant on health or safety of animals or humans, and this defaults to a “no” answer at this time. Berberis darwinii is a shrub that grows up to 2 m in height (Effect of light on the growth and photosynthesis of an invasive shrub in its native range). It forms dense, impenetrable stands that exclude native species, and can also persist beneath the native forest canopy (Allen 1991) (Photosynthesis and water-use efficiency: A comparison between invasive (exotic) and non-invasive (native) species). Forms dense spiny thickets (Weber 2003). Weed may have a minor effect on recreational use and would have an effect on aesthetics. Weed may impede individual access (Victorian Invasive Plants). Its growth habit allows it to form dense, impenetrable thickets that exclude other plants (Weed Risk Assessment: Berberis darwinii). Reproduces by seed and vegetatively resprouts from base (Weber 2003). Reproduces both vegetatively and sexually (Victorian Invasive Plants). Reproduction occurs via seeds and possibly suckers (Blood, 2001) (Weed Risk Assessment: Berberis darwinii). Propagate by seed or hardwood cuttings (RHS). Darwin's barberry (Berberis darwinii) reproduces mainly by seed (Weeds of Australia Biosecurity Queensland Edition). Is a prolific seed producer. In sites directly beneath the parent canopy, the total number of emergent seedlings differed in years, and differed in proportion to the total number of seeds produced: in Year 1, there were 135,796 seeds and 18,432 seedlings estimated per m2, while in Year 2, there were 33,796 seeds and 9,796 seedlings estimated per m2 (Linking seed dispersal, germination and seedling recruitment in the invasive species Berberis darwinii (Darwin’s barberry)). ‘Production of large quantities of fruit’ (Waipara et al 2005). ‘Mature flower survival to produce ripe fruit (55% in 1987 and 44% in 1989) was high’ (Allen & Wilson 1992). 10 – 20 flowers are in the axils of leaves and fruit contains 2-7 seeds. ‘Seedling density can be high’ (Weber 2003). Greater than 2000 propagules per flowering event (Victorian Invasive Plants). In its native area of Chiloé (Chile), a wetter region than its distribution range in Argentina, high seed germination and seedling growth occurs both under the forest canopy and in gaps with canopy openness greater than 20 % (Figueroa and Armesto 2001; Figueroa and Lusk 2001; Figueroa 2003) (Effect of light on the growth and photosynthesis of an invasive shrub in its native range). Berberis darwinii flowers in spring (Aug–Nov) and fruits in summer (Dec–Feb) in New Zealand, although both fruits and flowers can be found on plants almost year-round (Webb et al. 1988). Seed germination occurs in the spring following dispersal (Allen and Wilson 1992). Anecdotal evidence suggests that it has a transient seed bank, but this had not previously been tested. By far the majority of the viable seeds germinated during the first spring following seed production. All germination from seed bank samples occurred in the spring following soil core extraction. However, few seedlings emerged from the seed bank. Almost all seeds germinate the first spring following dispersal, regardless of microsite conditions. This results in a carpet of seedlings that extends for hundreds of metres from the parent population (KGM, pers. obs.). The chances of at least some of these seedlings emerging in sites where conditions are suitable for establishment are likely high. Seed addition studies found that B. darwinii seeds germinate successfully in all light environments, but seedlings only establish in high light environments (McAlpine and Drake 2003; McAlpine and Jesson 2007) (Linking seed dispersal, germination and seedling recruitment in the invasive species Berberis darwinii (Darwin’s barberry)). ‘Plants growing in high light can produce fruit within two years’ (McAlpine 2006). Produces propagules between 1 – 2 years after germination (Victorian Invasive Plants). Berberis darwinii flowers in spring (Aug–Nov) and fruits in summer (Dec–Feb) in New Zealand, although both fruits and flowers can be found on plants almost year-round (Webb et al. 1988) (Linking seed dispersal, germination and seedling recruitment in the invasive species Berberis darwinii (Darwin’s barberry)). Flowers in winter (February) (eFloras). Flowering occurs mainly during winter and spring (i.e. from August to November) (Weeds of Australia Biosecurity Queensland Edition). In California flowers March - June (Calflora; Jepson). Produces blue-black berries (Effect of light on the growth and photosynthesis of an invasive shrub in its native range). Seeds were widely dispersed by birds, up to 450 m from the source population. The shape of the dispersal curve was similar for both years, with 92% of seeds falling directly beneath, or at the edge of, the source canopy, 6–7% dispersed within 100 m from the source, and the remaining 3–4% being dispersed up to 450 m away (Fig. 1). When only bird-dispersed seeds are considered, these percentages change to 65–76% of recovered seeds landing directly beneath, or at the edge of, the source canopy, 23–29% dispersed within 100 m from the source, and the remaining 1–5% being dispersed up to 450 m away. Gravity-dispersed seeds (fruits) were only found in seed traps located directly beneath B. darwinii plants (i.e. in the –10 and 0 m locations) (Fig. 1), but could potentially be dispersed further by rolling along the soil surface (Linking seed dispersal, germination and seedling recruitment in the invasive species Berberis darwinii (Darwin’s barberry)). These seeds are commonly spread by birds and other animals that eat the fleshy fruit (Weeds of Australia Biosecurity Queensland Edition). Fruits are eaten and dispersed by birds and possums (Waipara et al 2005). May supply food for one or more minor pest species (Victorian Invasive Plants). An exhaustive Google/Google Scholar search did not reveal any evidence, there are no morphoplogical adaptations for this kind of dispersal, and this defaults to a “no” answer at this time. They may also be dispersed in dumped garden waste (Weeds of Australia Biosecurity Queensland Edition). An exhaustive Google/Google Scholar search did not reveal any additional evidence, and there are no morphological adaptations for this kind of regular dispersal, and this defaults to a “no” answer at this time. Reviewed by Denise Knapp and Eric Wrubel.